Built to work on grass and turf, Pro Training Agility Poles are designed for versatility and performance. Built to work on grass, turf and courts, the Pro Training Agility Poles feature a telescoping design that lets you use them for different phases of training and practice. Plus they offer added versatility, such as working as hurdles, when combined with Pro Training Agility Cones. When it comes to improving footwork and ball handling skills, poles are hard to beat. They can be combined with cones, arcs and flags for use in practice. Pro Training Agility Poles have a superior telescoping design that allows for three different heights settings— 24 inches, 45 inches and 60 inches. 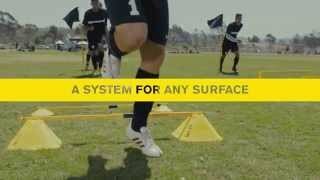 This lets you adjust them to fit different needs, including specific drills, setting up practice fields and to use as corner flags for games. Each set includes 8 Pro Training Agility Poles with protective caps, 125 mm detachable spikes and a convenient carry bag. With their unique design, the poles work on grass, turf and courts when combined with our Pro Training Utility Weight.